Lucasylve in game: 2,036 Who? Important notice! Pokemon Lucasylve is a fictional character of humans. Lucario (Japanese: ???? Lucario) is a dual-type Fighting/Steel Pokémon introduced in Generation IV. It evolves from Riolu when leveled up with high friendship during the day. It can Mega Evolve into Mega Lucario using the Lucarionite. Lucario is a bipedal, canine-like Pokémon, with fur that is predominantly blue and black. It possesses a short, round spike on the back of each forepaw, in addition to a third on its chest. It has a long snout and ears. When its mouth is open, it has two pairs of pointed teeth, one in the upper jaw and one in the lower. It possesses cream-colored fur on its torso, and blue fur on its thighs that resembles shorts. It has a medium length tail of the same blue color as well. It stands on its toes rather than on its entire foot. It has developed four small black appendages on its head, which rise when Lucario reads or manipulates aura, a special energy that it senses. 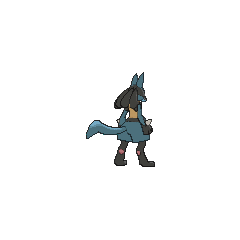 Lucario can study this energy to predict the movements of their opponents and track their quarry. They also have the power to manipulate this energy in an offensive manner, in the form of explosive spheres of energy. Lucario can understand human speech, and have been reported to communicate with humans through telepathy. As Mega Lucario, its cream fur becomes longer, and its thighs slim down. It develops more spikes on the back of its paws, which have turned crimson. It also develops spikes on both of its feet, which have become crimson too. Its aura-sensing appendages grow longer, and two of them are tipped in crimson. Its shoulders also possess a spike each. Its aura heightens throughout its body, which formed black markings on its blue fur. 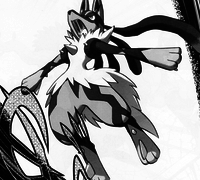 Mega Lucario was originally believed to be the first discovered Mega Evolution. Lucario is considered to be prideful, and is extremely loyal to its Trainer. It also seems to have a natural sense of justice. It usually lives deep in mountains very far from people to improve their skills. It is an exceptionally rare Pokémon. Lucario are primarily carnivores, hunting their prey in packs, though one Lucario was seen eating Berries and plants, like roses. It has been seen eating chocolate, even though chocolate is not part of its natural diet. Lucario was one of the main Pokémon in Lucario and the Mystery of Mew. He belonged to Sir Aaron and was sealed away in his staff for a thousand years. Ash later released him during a festival, and he helped guide him to the Tree of Beginning after Mew teleported Pikachu there. However, he sacrificed himself to save the Tree of Beginning. 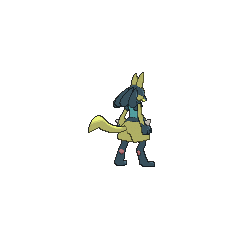 Lucario is Maylene's main Pokémon; it was first seen in Lost Leader Strategy! battling with Maylene in their training. Lucario used Aura Sphere to stop the battle of Electabuzz, Piplup and Pikachu. It was used in Maylene's matches with Paul, Dawn and Ash. This Lucario debuted in Steeling Peace of Mind! at Iron Island. When Ash and his friends traveled there after being contacted by Barry, they found the local Steel-type Pokémon fighting brutally against each other and the other Pokémon on the island. When a crazed Aggron attacked Ash, Riley stepped in and had Lucario attack it with Close Combat. Despite being a Steel type as well, Lucario wasn't immediately affected like the others of its type due to its strong aura. Cameron's Riolu evolved into a Lucario in Cameron's Secret Weapon! in a Vertress Conference battle against Ash's Snivy. It beat Snivy and fought against Ash's Pikachu in A Unova League Evolution, and won, but lost to Virgil's Flareon later in the episode. Korrina's Lucario debuted in Mega Revelations! as her walking Pokémon. The duo obtained a Lucarionite in the following episode, allowing it to Mega Evolve. It previously evolved from a Riolu. Another Lucario that can Mega Evolve into Mega Lucario appeared in The Aura Storm!, under the ownership of Korrina's grandfather Gurkinn. Lucario also makes a brief appearance at the intro of The Rise of Darkrai, where one is shown dodging a Rayquaza's Hyper Beam. A Coordinator's Lucario was seen on TV in Unlocking the Red Chain of Events! participating in a Double Performance along with a Froslass. A Lucario appeared in Alexa's magazine in The Journalist from Another Region!. 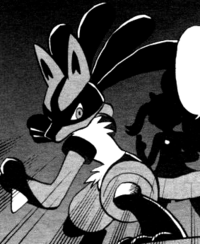 A Lucario that can Mega Evolve into Mega Lucario appeared in Mega Evolution Special I. A Lucario that can Mega Evolve into Mega Lucario appeared in a flashback/fantasy in Origins of Mega Evolution!. DP066 Lucario Ash's Pokédex Lucario, the Aura Pokémon, and the evolved form of Riolu. 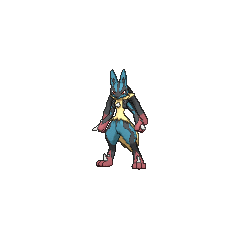 By sensing the aura of its opponents, Lucario can read their thoughts and movements. BW108 Lucario Cameron's Pokédex Lucario, the Aura Pokémon. Lucario has the power to detect their opponent's thoughts and actions by reading their aura. XY030 Lucario Ash's Pokédex Lucario, the Aura Pokémon and the evolved form of Riolu. Lucario reads the thoughts of others and anticipates their movements by sensing their auras. The Lucario from the eight movie appears in the adaption. Lucario is Hiori's primary Pokémon in Phantom Thief Pokémon 7. In the Pokémon Adventures manga, like in games, one appears under the ownership of Riley. Korrina has a Lucario which she Mega Evolves to help when X and his friends were attacked in Santalune City. In Pokémon Diamond and Pearl Adventure! Hareta gained a Riolu Egg in Serious Training on Iron Island!! 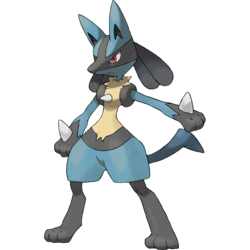 which hatched into a Riolu later on in that chapter then evolved in to Lucario in A Novel Test!!. Riley also has a Lucario which is his only known Pokémon. He trained it while he was on Iron Island in Serious Training on Iron Island!!. Cynthia's Lucario made a minor appearance during its Trainer's battle with Mitsumi. Maylene sent out her Lucario to take on one of the Galactic Grunts. Lucario is a playable character for the arcade fighting game. Its moves include Force Palm, Bone Rush, Extreme Speed, and multiple variations of Aura Sphere. Upon entering Burst form, it Mega-Evolves and can use the Burst Attack Aura Blast. Pokémon Mystery Dungeon: Red Rescue Team and Blue Rescue Team: Lucario is seen as the greatest rescue leader of all time, and his adventures have become legendary. While the player never meets Lucario, Alakazam tells the player that his goal is to become closer to Lucario's greatness. Earning 15000 Rescue Points will put the player in the top Rescue Rank—Lucario Rank—at which point the Lucario Statue will be displayed outside the Team Base. Pokémon Ranger: Shadows of Almia: Lucario is the guardian of the Blue Gem. A well-trained one can sense auras to identify and take in the feelings of creatures over half a mile away. It's said that no foe can remain invisible to Lucario, since it can detect Auras. Even foes it could not otherwise see. By reading the aura of all things, it can tell how others are feeling from over half a mile away. By reading the auras of all things it can tell how others are feeling from over half a mile away. Black streaks all over its body show where its auras and the energy of Mega Evolution intermingled and raced through it. It readies itself to face its enemies by focusing its mental energies. Its fighting style can be summed up in a single word: heartless. Moves marked with a superscript game abbreviation can only be bred onto Lucario in that game. It launches orbs of Aura power. It becomes stronger if its Aura cloaks it. Lucario is traveling through the PokéPark, taking time to enjoy Tangrowth's Swing Along and Rayquaza's Balloon Panic. He likes some of the other Attractions, too. He is traveling around PokéPark for training. He likes to meet strong Pokémon. 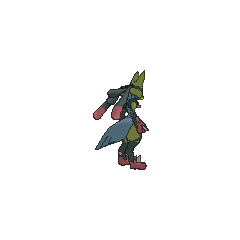 For other sprites and images, please see Lucario images on the Bulbagarden Archives. Because of its debut during the Advanced Battle season, Lucario appears in its season opening, Unbeatable, which is set in Hoenn, despite being a Generation IV Pokémon. Mime Jr. and Weavile also make opening cameos. Lucario's English name was revealed on February 9, 2006 with the announcement of the title of Lucario and the Mystery of Mew. In Pokémon Ranger: Shadows of Almia, Lucario is the only one out of three Gem Guardians that is not a Legendary Pokémon. In Pokémon Battle Revolution, Dusty wears a Lucario costume. Due to Lucario's combination of Abilities, in Pokémon Mystery Dungeon: Explorers of Time and Explorers of Darkness and Pokémon Mystery Dungeon: Explorers of Sky Steadfast only activates if Lucario becomes cross-eyed, or if the opponent has Mold Breaker. Mega Lucario has the highest base Speed stat of all Steel-type Pokémon. It also seems to be based on an Egyptian boxer. Boxing is a sport that is believed to have origins in Egypt. The markings on Lucario's face resemble a mask. Lucario may be derived from the reverse of the Japanese transliteration of orichalcum (a mythical metal) or oracle (referring to its supernatural abilities involving aura). It may also involve lupaster (a subspecies of the Canis aureus), Cairo, pharaoh, lykos (Greek for wolf), or luchar (Spanish for fight). Japanese ???? Lucario From the reverse of orichalcum (a mythical metal) or oracle (referring to its supernatural abilities involving aura). May also involve lupaster (a subspecies of the Canis aureus), Cairo, pharaoh, or lykos (Greek for wolf).